The International Space Station has its first Japanese commander. Astronaut Koichi Wakata of JAXA(the Japan Aerospace Exploration Agency) was handed over command during a ceremony held onboard the outpost early Sunday morning (March 9). Wakata, who has been a flight engineer aboard the space station since November, will lead the complex's 39th expedition crew through mid-May. "Welcome Wakata-san," radioed JAXA mission control in Tsukuba, Japan. "It is indeed a special day for the human space program, especially for the people in Japan." This photo was taken of JAXA astronaut Koichi Wakata aboard the International Space Station on Dec. 2, 2013. “I'm going shooting every day working with ultra-high sensitivity 4K camera in Japan in the cupola of the ISS,” Wakata tweeted. Koichi Wakata is replacing the space station's Expedition 38 commander Oleg Kotov, a Russian cosmonaut who after 166 days in orbit is returning to Earth with cosmonaut Sergey Ryazanskiy and NASA astronaut Mike Hopkins on Monday. The departure of their Soyuz TMA-10M spacecraft at just after 8:00 p.m. EDT (0000 GMT on March 10), will signal the beginning of Expedition 39. 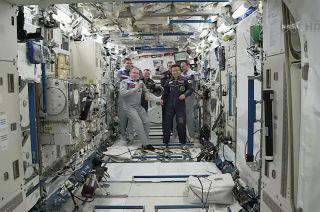 Wakata's initial charge are his two Soyuz TMA-11M crew-mates, Rick Mastracchio with NASA and Mikhail Tyurin of Roscosmos. The Soyuz TMA-13M crew, including NASA astronaut Steve Swanson and Russian cosmonauts Oleg Artemyev and Alexander Skvortsov, are scheduled to lift off to the station March 25 to complete the Expedition 39 crew. Wakata, now 50, was selected for Japan's astronaut corps in 1992 and four years later became the nation's third full-time astronaut to fly in space. Over the course of his three prior spaceflights, Wakata set records as Japan's first space shuttle mission specialist, his country's first astronaut to work on building the space station, and the first Japanese crewmember to complete a long-duration stay on the outpost. To date, he has logged more than 280 days off the planet. Wakata is the first-ever Japanese astronaut to command a space mission. "It means a lot to Japan to have its own representative to command the International Space Station," Wakata said in a briefing. "It's a big milestone for Japanese human space exploration to have this experience." "Since Japan has been involved in the International Space Station program, we have worked hard," Wakata said in a NASA interview. "JAXA launched the Japanese logistics module, an experiment module, the Kibo module." The Kibo lab, one of three science-dedicated modules that are attached to the space station, is the complex's largest room. It is outfitted with its own experiment airlock, robotic arm and platform (porch) for exterior science experiments. JAXA also launches cargo the space station using its H-II Transfer Vehicles (HTV), known as "Kounotori," or "white stork." To date, Japan has launched four of the unmanned resupply craft, with a fifth due to launch this summer. "Looking at the Kibo's performance and [HTV] Kounotori's contribution, Japan has become a very reliable partner of the International Space Station program," Wakata said. For the more than 13 years the station has been crewed, most of its commanders have either been U.S. astronauts or Russian cosmonauts. Sixteen NASA astronauts and 14 Roscosmos cosmonauts have headed expedition crews, though Russia has had two crewmen serve as commander twice, and one who has led four station increments. In 2009, European Space Agency astronaut Frank De Winne became the first non-American, non-Russian to lead serve as space station commander. Since then, only one other nation's astronaut has led the outpost, Canada's Chris Hadfield in 2013. Click through to collectSPACE.com to see JAXA’s mission patch for Koichi Wakata's stay aboard the International Space Station.